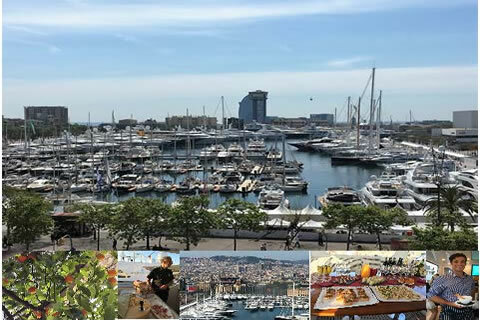 Yacht Charter Brokers Jenny and Nick Trotter were on hand to review close to 60 yachts attending the show at scenic Port Vell Marina. Charter Yachts in attendance ranged in size from 70-ft/21.25 meters to the largest private motor yacht currently available for charter at a commanding 311-ft/95 meters. Every yacht is unique with bespoke qualities and features reflecting the individual brief of each owner. INDIAN EMPRESS – 311ft/95m Oceanco motor yacht. With her impressive size, 17 staterooms and multiple entertainment areas, Indian Empress is ideal for corporate entertaining or private recreation. JOY – 229ft/70m Feadship motor yacht. Launched in 2016 JOY was commissioned to maximize outdoor space with multiple areas for dining and relaxing al fresco. The interior design and attention to detail is exquisite. Special features include an owner’s sports deck complete with basketball hoop and a beach club/night club at water level! JOY was awarded the prestigious “Best in Show” award. TAKARA 124ft/38m Sanlorenzo motor yacht. Launched in 2016 TAKARA has achieved a seamless balance of style and elegance in a relaxed ambience that embraces life on the water. Takara means “treasure” in Japanese and oriental influences are present throughout the yacht. Special features are the bow Jacuzzi and sunpad/cocktail area, side balconies and excellent outdoor dining areas. HUTIANE – 101ft/31m Cuneo Marine catamaran. Launched in 2011 HUTIANE offers a casually elegant, spacious beach club atmosphere with excellent outdoor spaces including a Jacuzzi on the aft deck overlooking the hydraulic swim platform. With a large array of watersports equipment and versatile accommodations this yacht is ideally suited for family groups of up to 10 guests. BROADWATER – 165ft/50m Feadship motor yacht deserves an honourable mention for her entirely new interior refit and outstanding crew. The yacht was ready for viewing and hosted a delightful cocktail party after arriving at 10:00am on the last day of the show due to a delay in crossing. Service with a smile! We would be delighted to tell you more about these and many other excellent charter yachts we visited at the show! Bookings are now underway for summer Caribbean and Mediterranean yacht charter holidays. Contact us to receive your personal yacht presentation.